This Safari operator met my needs and interests, since they are dealing with Primate Safaris, Gorilla Tracking, Bird Watching, Water Rafting, Camping Safaris , Mountaineering , etc. Upon my arrival at Entebbe International Airport on 15th of October, I was greeted by my driver guide Elijah and his helper Michael. And off we drove by a 4 x 4 van to the Nile hotel and Conference Center for the night. On the way the scenery was spectacular, banana plantations, tea plantations, Ankoli cows and bulls, upon arrival we stayed at Buhoma Homestead , This was the home of the elusive mountain gorilla at Bwindi Impenetrable National Park. The drive from Kampala to Bwindi took 10 hours, through lush green landscape, therefore I called it, in my opinion, Uganda, the Emerald of Africa. Bwindi impenetrable National Park is situated at the corner of three countries, Southwest Uganda, Northwest Rwanda and East of Democratic republic of Congo, previously known as Zair. This is also the home of the Batwa Pygmies. The purpose of this visit was to trek and observe the habituated mountain gorillas. To Habituate a gorilla means getting it used to humans, for tourism or research purposes.. This process can take up to two years. A tracker explains: "A group of wild gorillas is assigned to us and we set out every day, rain or sunshine, to follow them. When we find "our" gorillas, we spend the day sitting in the forest , making calming vocalizations or even pretending to eat leaves to show them that we are no a threat. After a few months the gorillas still remain hidden in the bush, but will cautiously peek through the vegetation at us. For many months, we see only a hand or a face of a curious gorilla poking through the bush. When a silverback is feeling more comfortable he will lead the rest of the group to feed in the open. Eventually people will approach up to 5m or 15 feet. Then gradually we allow tourist to see the gorillas". Taking photos without flash, use a fast film 400-800ASA. There are only 6 people permitted to join a group, and upon finding the gorillas you can spend only one hour with them. There are certain rules one must obey before going on a gorilla track. At 8:30 AM three groups of trackers each had 6 visitors were assigned to a particular group, I was assigned to HABINYANJA GROUP. We were all provided with gorilla rules and regulations. It is important to be responsible ecotourist. 3. Developing the national economy. 4. Maximum of 6 people per group. 6. You will be taken where the guide left the gorillas the night before. Look out for gorillas nesting and fresh droppings. When you are with the gorillas, keep to a minimum 5 meters, stay together, Do not drink or eat near the gorillas, sometimes they charge, keep down and do not look straight into their eyes. No flash photography and maximum time is one hour. The track was very difficult and steep but the reward was enourmous. After a very steep climb we reached one family, we me the silverback and 2 young male inline, and females with babies. We visited for one hour and then descended back to camp. In South West Uganda covering 330 KM2 and the others in the Virunga Volcano Range (VVR), the Virunga Volcano Range is ecologically Homogenous (same flora and fauna) covering 3 countries. Mgahinga Gorrila National Park in Uganda, Vocano National Park in Rwanda and Virunga National Park in Th Demorcratic Republic of Congo. Together consists of 450 Square Kilometers. The main threat to the gorillas are human transmitting deseases. Later in the afternoon we visited the AIDS ORPHANAGE, the community in Bwindi is doing wonders with them. We stayed for overnight at Buhoma Village. There is a Buhoma Village Walk , contributing to a changing community. The walk starts and ends at the Buhoma Rest Camp, which is located at the entrance to Bwindi Impenetrable National Park, the rest camp consists of 5 traditional bandas, which provide budget accommodation for tourists. Visitors can visit the local handicraft shops, the women design and produce a wide variety of traditional crafts, wood carvings, dyed cloths etc. One can visit the Batwa pygmies dancing and singing. The proceeds that the Batwa receive from their cultural performances go towards improving their livelihood. Also one can visit the Medicinal healer, the traditional medicine man, visit the local school and banana brewing, one can learn about the different kind of bananas, from a simple fruit to a thirst quenching beer. (RWARWA) and finally to a local gin (WARAGI) the fee for the tour goes back to the community. Of the Moon, create a vast wetland system comprising of two main lakes, George and Edward, and the connecting Kazinga Channel. This is a paradise for various birds, and there is a huge bird sanctuary. Thousands of Hippos populate these lake shorelines. Big herds of Buffalos and elephants can be seen all along the shore line, the time of my visit there was an epidemic of Anthrax and many of the Hippos and Buffalos died, By the time I left Uganda the local veterinarians solved the problem. Ten primate species can be found including chimpanzees at the Kyambura Gorge. Several ethnic groups that are closely related inhabit this part of the country: the Banyankore, Bakiga and Bakonjo. We started at the South Side of the park at Ishasha, the home of the famous tree-climbing lions, they favorite tree is the large fig trees. The open savannah is the home of the Ugandan Kob, the topi and buffalos. It took us few hours until we spotted two lionesses relaxing on the branches. There is the traditional Game Drives, early in the morning and late afternoon. We also visited the Traditional Salt Works, at the enclave of Lake Katwe town. Since the 14th century salt has been mined by traditional methods. Salt production peaks during the dry season. The park is also the home of the prehistoric looking Shoebill stork. We also had a walk though the steep Kyambura Gorge, home to chimpanzees, black and white Colobus and red tailed monkeys. We spotted some habituated chimpanzees from far away, sighting was not that good, but the gorge itself is spectacular. In Queen Elizabeth National Park we stayed at the Mweya Safari Lodge. Located near the Kazinga Channel, in the middle of the park. In the heart of the spectacular Queen Elizabeth National Park It is a luxury resort. The rooms are spacious, regal and very luxurious. The lodge has a swimming pool, a bar and a restaurant with international cuisine, boardroom and conference room. A wide range of credit cards are accepted at Mweya Safari Lodge. The Lodge has an airstrip and only 45 minutes flight from Entebbe. Lunch trips on the Kazinga Channel. Chimpanzee trekking into Kyambura Gorge. Oct 19th, still in Queen Elizabeth National Park, heading toward Baboon Cliff and Crator Lakes, some are dormant with a savannah like surrounding consists of Aacia trees The park has the highest biodiversity rating of any game park in the world. Oct 20th. We drove to the base camp of Rwenzori Mountains National Park, we drove to Ibanda to visit the starting point of Rwenzori , walked to the Park Gate and had Some orientation by the local people who work for the Uganda Wildlife Authority. These range of mountains are also known as the Mountains of the Moon. L'Hoesti monkey. The forest has the most dense population of primates. Black and white colobus, blue monkey and grey-cheeked mangabey, red tailed monkey, bush babies and pottos. The park hosts about 325 species of birds. within the park. At KANYANCHU, a community of chimpanzees has been habituated since 1991. Allowing visitors the opportunity to view the great apes in their natural environment. The park offers primate walk. This walk starts from Kanyanchu River Camp at 8:00 am or 3:00 pm. It lasts for 2-4 hours. We were walking with a local guide and we had good viewing of the chimpanzees for about one hour. The park has some very simple Bandas that can be rented. There is one elevated banda which is self catering (self contains kitchen and bathroom) Food can be provided by the local canteen. Goodall Institute started the Kibale Primate Habituation Project, which focuses on habituation the chimpanzees to human presence. This has increased the chances of viewing chimpanzees to over 90%. Funds generated from tourism help to protect the park and cary out the research and support local community projects. Makerere University has also established a Biological field station at Kanyawara where several researchers are based. Two of the local tribes the Batooro and bakiga utilize the forest for food, fuel building materials and medicine. 20% of park entrance fees goes back to the community. Last December, I had the opportunity to visit with the habituated chimpanzees at Gombe Stream National Park on Lake Tanganyka, Tanzania. It is the main research station of habituated chimpanzees run by the famous Jane Goodall. Chimpanzees range in woodland and forest across equatorial Africa. Chimpanzees are endangered due to loss of habitat and illegal poaching. The best way to locate them is by listening to their screams and panting, drumming on the buttresses trees and by their nesting pattern the night before and fresh dropping. the age of 20. Unlike other primate, chimp male tend to get grey and or bald. Sometimes walk in an upright position. In the community young or adult can mate with her. But at her estrous, she will mate with the Alpha male, or the dominant male. Chimps. They are known to kill other male and gain their territory and females. Males do eat young bushpigs and other small monkeys. Chimps feed on medicinal plants that can cure various parasites. They do use tools such as twigs to fish for termites and stones to open hard nuts. Lowland tropical rain forest in East Africa. It has about 435 species of birds. It is also known for its male and female hotsprings. There are four ethnic groups living around the park. The Bamba and Bakonjo are fund in the valley and mountain slopes and both are agriculturalists, coffee, cocoa, bananas, rice and potatoes. The Batuku who occupy the rift valley floor, are the pastoralists And the famous BATWA (pygmies) are hunters-gatherers (which we visited extensively) and are an Ituri ethnic group who depends on Semuliki Forest. The Batwa prefer to spend time at their familiar surrounding, the forest rather the new houses that were provided for them. They do live by hunting and food gathering assistance from local communities and from tourists who interact with them. Semuliki National Park is haven for birders. Today we drove to the northern part of our tour, Murchison Falls Conservation Area. Famous Rothchild's Giraffe. The park offersgame drives that take you through open grasslands and acacia woodlands, leading to the Nile delta where the river joins Lake Albert and becomes the Albert Nile. It is important to visit the top of the falls and the boat ride to the bottom of the falls. 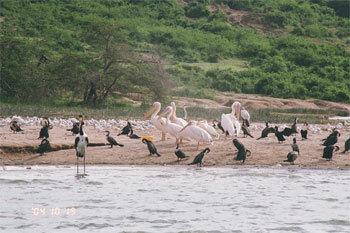 Murchison Falls offers various accommodations from camping to luxury. We stayed at the famous Paraa Safari Lodge, this is under the same management as Mweya Safari Lodge in Queen Elizabeth National Park. Contact information same as Mweya Lodge. All rooms are facing the river, one can hear the Hippos all night, The lodge provide an international cuisine. Paraa Safari Lodge is a big hotel complex with a modern interior design, has a swimming pool and conference facilities. The Launch Trip to the bottom of the falls is the main attraction of the park. Hippos are everywhere. Bird watchers are seen very often. The African fish-eagle is one of the most conspicuous birds found along the river. Of special interest is the shoebill or whale-headed stork. A giant, solitary bird, it is an aggressive predator that feeds on fish, frogs, water rats, lizards, snakes and even small crocodiles. It has binocular vision, its yellow eyes that stare without blinking indicate that the shoebill is mainly a nocturnal hunter. They live in marsh and swamp. Murchison Falls is one of the few places in Africa that the shoebill can be seen. One can also see the Goliath heron and the saddle bill stork. The park provides morning and afternoon photographic safaris. The top of Murchison Falls is accessible from the south bank of the river. The drive from Paraa Safari Lodge takes about 45 minutes and 40km. The visit to the top of the falls is breathtaking natural spectacle, the most powerful rush of water anywhere in the world. There are also Savannah Walking Safaris, to watch the most amazing Rothchild's giraffes, groups of at list 50 giraffes at one time. Oct 24th back to Kampala to join ATA members at the ATA-Africa Travel Association's Eighth Cultural & Eco-Tourism Symposium in Kampala Uganda-October 24-29th 2004 in the presence of H.E. Yoweri K. museveni, President, of the Republic of Uganda. And under the Auspices of H. E. Professor Edward Rugumayo, Minister of Tourism, Trade and Industry. At the Nile Hotel and Conference Center. The Chimpanzees are members of the great apes and they live only in Equatorial Africa. This Sanctuary was established in 1988 to care for orphaned confiscated chimpanzees in Uganda. The aim is to provide a safe place for this chimps. At the time of my visit there were about 30 residents. This Sanctuary provide the visitors with educational experience and benefits the local communities. Jane goodall assisted in creating this sanctuary. The chimp Sanctuary and wildlife Conservation Trust are partners with six international organizations committed to help conserve the wildlife. Born Free Foundation, Environmental Conservation Trust of Uganda, International Fund for Animal Welfare, Jane Goodall Institute,Uganda wildlife Education Centre and Uganda Wildlife Society. Ngamba Island has 40 hectares of rainforest, of which 39 is allocated to the chimps and one hectare for the facilities and staff and visitor. It is eco-friendly with composting toilets, rainwater collection, and solar energy for electricity and hot water. These chimps were previously taken from the wild and needed very special attention and care. One can visit for the day or stay for few days at very luxurious self contained tents. At the time of my visit there were 4 such tents, I did promise to return and stay with the chimpanzees for few days. This place is doing wonders for the chimpanzees. From Entebbe one takes a boat ride on Victoria Lake to Ngamba Island, depends on the weather, it can take between one to one and half hour ride each way. Upon returning from Ngamba Island we went directly to visit The Uganda Wildlife Education Centre. It was previously the Entebbe Zoo, the zoo suffered from lack of management and in 1992, a development study of Entebbe Zoo was conducted by the NY Zoological Society and recommended that the zoo be converted into an educational center, The place was to be a sanctuary for orphaned animals. This was created on May 1994 as the Uganda wildlife Education Centre Trust. The objective was conservation Education and Rehabilitation of injured animals, breeding of endangered species and a recreation Centre. On October 31st I left Uganda extremely happy of seeing and participating in so many wonderful events. An active member in ATA since 1993. The article was written due to my personal experience and some assistance in logistics from the Ugandan Wildlife Authority.